SOPHIE is a cross-dispersed échelle spectrograph permanently located in a temperature-controlled chamber in the second floor of the 1.93-m telescope building. First light with this instrument was achieved on July 31, 2006, but the first wavelength solution was obtained only on 24 August 2006. 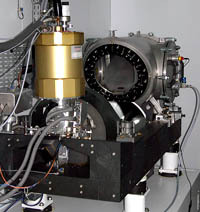 The spectrograph is fed from the Cassegrain focus through either one of two separate optical fiber sets, yielding two different spectral resolutions (HE and HR modes). The spectra presently cover the wavelength range 3872-6943 Å. The instrument is entirely computer-controlled and a standard data reduction pipeline automatically processes the data upon CCD readout. For late-type stars (F,G,K,M) this includes radial velocities by numerical cross-correlation techniques which can yield very accurate velocities (down to 2-3 m/s using simultaneous Th calibration), depending on the signal-to-noise ratio. Each fiber set consists of two circular entrance apertures (3 arc-sec wide) separated by 1.86 arc-min in the focal plane (nominally in the E-W direction). They feed light into the spectrograph through optical fibers of 100-micron diameter. Fiber A is normally used for the target while fiber B can be used to obtain the sky spectrum or for a simultaneous calibration lamp exposure. Fiber B can also be masked. Both fibers A and B can be simultaneously illuminated by one of the calibration lamps, or by the sky. The HR fiber pair includes optical scramblers designed to render the measured radial velocities largely insensitive to the exact position of the star in the entrance aperture.These fibers also incorporate a 40 micron tilted exit slit to achieve high spectral resolution (HR mode, R=75000). The other fiber pair is used when a higher throughput is desired (HE mode, R=40000), particularly in the case of faint objects. These average resolving powers near 5500 Å have been derived from the FWHM of extracted Th-Ar spectra in both modes. The difference in resolution can be seen in a comparison between the two modes in the red (6870 Å) region of the telluric water vapor bands. The difference in throughput between the HE and the HR modes is a factor of 2.5 (1 magnitude). Switching between the two modes involves moving the fiber heads in the adapter which takes about 3 minutes. The adapter (or bonnette) carrying the optical fiber heads is mounted at the Cassegrain focus of the 1.93-m telescope. This is the same adapter used by Elodie which has been modified for Sophie. It includes a new autoguider CCD camera, the calibration lamps and atmospheric refraction correctors. The field of view of the autoguider is 4.6 arc-min. The telescope pointing system features digital encoders in both declination and hour angle with an accuracy of 5 arc-sec. A pointing model corrects for mechanical flexure and allows for accurate setting of the telescope. The coordinates are displayed in the observing room and in the dome. There are limits on the pointing of the telescope due to its asymmetrical english-type mounting. The spectrograph is enclosed in a thermally insulated chamber whose temperature is accurately regulated and humidity is under control. This chamber is located in an air-conditioned room where are located the instrument and telescope electronics. This room is separated from the observing area, which also air-conditioned, by a special insulated wall. This three-level temperature control ensures a high degree of thermal stability for the instrument. The spectrograph itself is mounted on shock absorbers and is supported by the telescope pier structure. Its dispersive elements are in a constant-volume vessel filled with Nitrogen so as to insure a constant pressure and thus a constant index of refraction. SOPHIE has now its own thermal insulation cover, so the final thermal configuration has been achieved. The temperature within the constant-volume vessel is now stable to ±0.01°. This illustration shows the principal optical elements of the SOPHIE instrument. The 52.65 grooves/mm R2 échelle grating manufactured by Richardson (RGL), blazed at 65°, has dimensions of 20.4x40.8 cm and is mounted in a fixed configuration. The spectrum, as projected onto the e2V 44-82 CCD detector (4096x2048 pixels), yields 41 spectral orders, of which 39 are curently extracted, between 3872 and 6943 Å. See the list of orders for information on the details of the spectral format. Cross-dispersion is done with a OHARA PBL25Y glass prism of angle 31° and dimensions 28x22 cm. 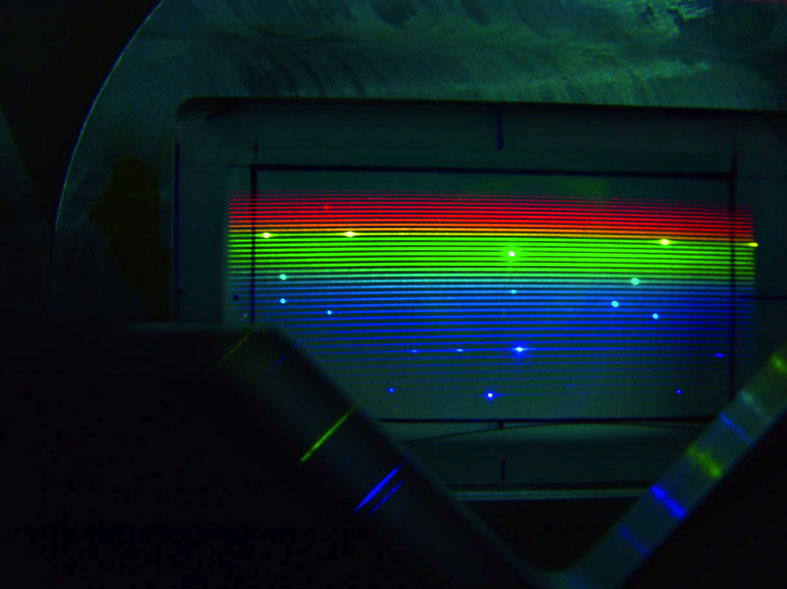 A color image of the echelle spectrum projected onto a translucent screen, obtained with a digital camera during the instrument integration process, shows the approximate spectral area sampled by the CCD chip. Originally, the calibration lamps used were those mounted in the Cassegrain adapter designed for ELODIE : a tungsten lamp for relative flux calibration ("flat field") and a Thorium lamp for wavelegth calibration. In order to improve the stability of SOPHIE, all calibration lamps (Thorium, Tungsten, LDLS and recently a Fabry-Perot étalon) are now housed in the same temperature-controlled room downstairs where ELODIE was located. Exposure times for all lamps are set automatically through the STS. Light from the Th lamp is filtered by a specially designed filter to cut-off light from strong near-infrared Argon lines which were polluting the Th spectrum. The present level of scattered light in the interorder space is about 0.6 % of the signal in the orders for stellar spectra, as measured at the center of order 26 (corresponding to the center of the V band). This scattered component is due to infrared light from orders redward of 7000 Å which are not directly recorded by the CCD but which illuminate the optical elements and create a faint diffuse light which is superposed onto the observed spectrum. This was seen when the Thorium filter was first installed (see above). 'Slow' read-out speed is recommened for S/N < 30. The bias level is measured over the full image when doing a calibration sequence, but accurate values are measured for every exposure using the 53-pixel overscan zones on each side of the CCD frame. WARNING: Make sure to do a bias exposure prior to any observing when changing CCD read-out speed (both for Fast to Slow and for Slow to Fast). Calibration of the CCD gain and read-out noise can now be obtained using the new LED lamps installed in the spectrograph. Preliminary results confirm the above values for the Fast and Slow read-out speeds. The dewar maintains the CCD at -99° for a maximum duration of 48 h, but is automatically refilled every 24 h.
A plot shows the expected S/N ratio (per pixel) at 5500 Å as a function of the magnitude of a star (for standard exposure times of 5 minutes and 1 hour) in the two different modes: High-Efficiency (HE) and High-Resolution (HR). Observations obtained after the aluminization of the telescope optics in early September 2006 confirm these calculations. An exposure meter is presently available which gives the real-time plot of the exposure level. This system employs a H8259-01 Hamamatsu photomultiplier which measures part of the light ultimately lost due to obturation by the grating. A calibration of the count rate as a function of magnitude has been obtained in July and August 2007 for the HR and HE modes (plotted as black circles and red triangles, respectively). This calibration is valid for obj_A and obj_AB modes, but only valid for V<7 for thosimult mode. The gain in efficiency with SOPHIE in the V band has been determined to be 3 magnitudes in HE mode relative to ELODIE (and consequently 2 magnitudes in HR mode) by comparing S/N values (per unit wavelength) for the same star taken with the two spectrographs. Spectra of relatively faint sources are now well within reach, as shown during the science demonstration phase where a S/N (per pixel) of 27 (in V) was reached in 90 min for a V=14.5 object in HE mode. 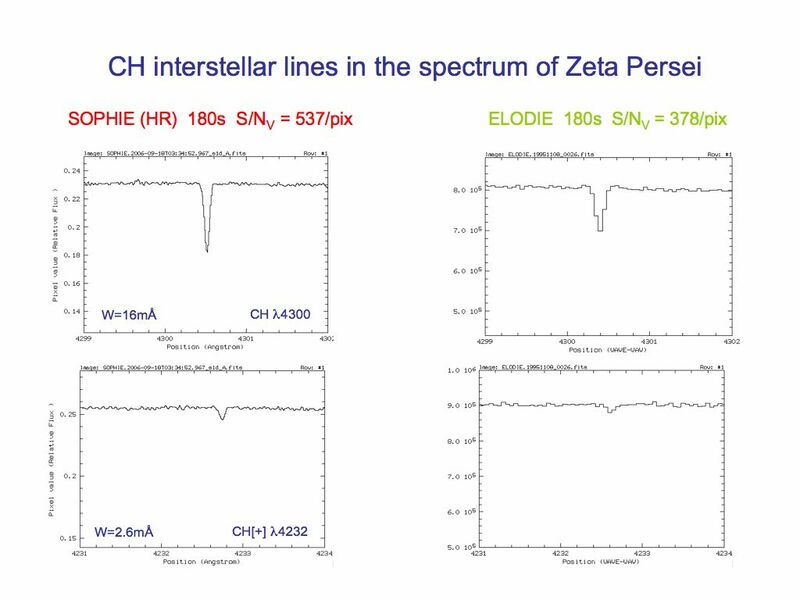 For a comparison between spectra of the same star taken with SOPHIE and ELODIE, see the case of a couple of interstellar lines present in the line of sight to Zeta Persei. The stability of radial velocity measurements in HR mode is presently of the order of 3-4 m/s over several months. The short term stability is much better, as revealed by a recent observing run on Procyon where acousting mode oscillations of 50cm/s amplitude were detected. The relative velocity drift between fibers A and B has been measured to be 1.3 m/s, compatible with the error on the velocity zero-point. Three (actually four) different systems are used when observing with SOPHIE. Please read the new version of the Software User's Guide (in french). All spectrograph functions are controlled via dedicated software on a Windows workstation called 'pcsophie' which displays the complete status of the spectrograph and of the exposure in progress. All exposures are started from this computer. It talks to the CCD controller via a Linux workstation called 'sophieccd'. Observing sequences are prepared on a second Linux workstation called 'sophiests', or STS for short. All information needed for a given exposure (calibration or science frame) is normally entered through the STS. Parameters for the science exposures come from a user catalog which must be prepared in advance. These parameters are automatically transfered to 'pcsophie' where the exposure will be started manually once the telescope has been pointed to the target and the autoguider has been enabled. An estimate of the required exposure time can be requested from the STS, but is computed for an observation at the zenith. The reduction of the data is done automatically on a third Linux worstation called 'sophiedrs', or DRS for short. For a science frame, this reduction includes bias subtraction, optimal order extraction, cosmic-ray removal, flat-fielding, wavelength calibration, cross-correlation with a suitable numerical mask and merging of the spectral orders. An off-line facility is available on the DRS for detailed examination of the reduced data and for additional cross-correlations. The SOPHIE spectrograph features an entirely automatic data-reduction pipeline, adapted from the HARPS software designed by Geneva Observatory. This software performs localization of the orders on the frame, optimal order extraction, cosmic-ray rejection and wavelength calibration. Also computed for each order are the blaze function and a "one-dimensional" flat field, both derived from a Tungsten lamp exposure. The latter is derived for each order from the average of the rows perpendicular to the dispersion. The limited extent of the orders and the high quality of the CCD cosmetic response makes any further second-order flat-field correction unnecessary. The extracted spectrum is saved as an 'e2ds' FITS file, which contains the S/N values for each order and the wavelength solution polynomial coefficients. The orders are then reconnected after correction for the blaze function, yielding a 's1d' FITS file with a 0.01 Å wavelength step, which includes the barycentric correction. All identification, calibration and reduction information is written into the file headers. See the data products page for more detailed information. See also several examples of e2ds and s1d spectra for the hot star HD 34078 observed in HR mode. The data reduction pipeline on the DRS machine, which is controlled by the template specified through the STS, proceeds entirely automatically including the radial velocity cross-correlation and merging of the orders. Several numerical cross-correlation masks are available : F0, G2, K0, K5 and M4 and the closest one to the spectral type of the star is selected by the DRS. If none corresponds, by default the G2 mask is used. The on-line velocities are corrected to the barycenter of the solar system using the coordinates given in the STS catalog. On-line estimates of the line bisector, error on the velocity and v*sin(i) [if the B-V color is known] are also available. An off-line facility is available on the DRS machine for detailed examination of the results and further cross-correlations with any of the available masks. See the data products page for more detailed information. Each new observer is given a complete introduction by local staff to recommended observing procedures and tutored on software operation and data reduction as needed for succesful observing. This introduction normally takes place in the afternoon (14h local time) preceeding the first night of the run. If this is not so, log in with the (same) username/password available in the document you will find in the observing room. Follow carefully the detailed instructions given in this document which should lead you up to the start of an exposure and its full reduction. This will ensure you that the system is working correctly. In case of any problem, contact software support (nominally C.Carol, phone 6475). The observer must report at the end of the night on any telescope or spectrograph technical problems using the web report form. A full report should be filled in at the end of the run and mailed to ohp.telescopes AT osuphytheas.fr. It is no longer necessary that you log off from the different machines at the end of the night. At the end of your run, a special software tool, called DAU, is available to copy the raw and the reduced data onto a DVD or a USB pocket disk. All data taken with SOPHIE are automatically archived the next day onto an exernal system, 'atlas' (DELL PowerEdge R620, running Debian Linux, coupled to a PowerVault MD1200 raid array), hosting the SOPHIE Archive. Raw and reduced data are fully protected for one year, after which it is made available to the community. An extended 5-year protection can be granted for special projects by the relevant Time Assignment Committee. In this case, data still become available after one year but with time-related information masked. This information is unmasked after the 5-year period. A night assistant is on duty at the 1.93-m telescope at all times (except for meal time around midnight) from sunset until start of nautical twilight and is responsible for telescope safety. He will open, close and turn the dome, point the telescope, start and set up the auto-guider. Observing is the responsibility of the astronomer. The night assistant is normally able to deal with most problems in the course of the night, but in very difficult cases he might call up resident staff for help. Phone numbers of on-duty personnel are listed in the observing room. Detailed instructions on how to overcome possible minor problems ("bugs") with the software and hardware are available in the observing room. Check with the SOPHIE support astronomer or with the night assistant.